This speech was written for the Global Climate Ambassadors at the transition of the European Green Capital Award from Copenhagen to Bristol on December 8, 2014. It was delivered by four separate children – one from each city. Their names are Aliyah Bergström (Malmö), Jonas Ilmari Balsby (Brussels), Siw Rønne Appel (Copenhagen) and James Gibson (Bristol). You can also read it on their website. 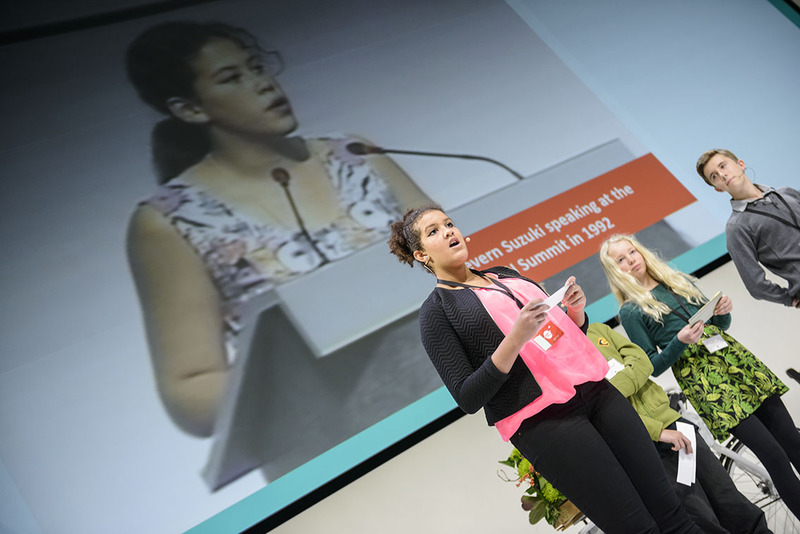 We are children from Malmo and right next door we are holding the Children’s Climate Summit. Because we can see that something is missing. At the United Nations Earth Summit, 12 year old Severn Suzuki walked up on the stage in Rio de Janeiro and made the leaders of the world listen. Last week she turned 35. She is now married and has two kids. A generation has come and gone, but what has changed? When Severn Suzuki spoke a generation ago, climate change was new to many and so was sustainable development. Now we know that climate change will not be something for you to check off and move on to the next item on your to-do list. We can’t allow ourselves to be set back when it comes to the work of the next generation. The floods have already reached our shores. In India, numerous homes and villages have been swept away. In Zambia, they are forced to consider floating schools and in Bangladesh school boats are already a harsh reality. In the Pacific, islands are about to disappear entirely and populations will become climate refugees in other countries. Something is missing: It might be action. We are children from Brussels and we are participating in the Children’s Climate Summit. Because we cannot see how YOU can possible deliver that action WE need. Climate change will demand our focused attention for the next generation – and the next – and the next. The big cities spoke loud and clear when the national governments remained silent. But where is the action form the European Union? We are the next generation and we will take over when you are gone, but will we be ready? Will we be able to maintain the work that has already been done? And move towards even further progress? Do we have what it takes to take climate action to the next level? It is all on the line when we go from this generation to the next. So much remains to be done – to even keep status quo. So much could be done. The environmental effects of climate change are here – right now. But it CAN be fun to work together across generation. It CAN be engaging if it is explained in understandable words and your generation CAN still act as role models. Time is running out, but you still have a window of opportunity. Yes, something is missing: It might be the link to the future. We are children from Copenhagen and across the world we – the children – agree: Something important is missing when selecting the next European Green Capital. That is what we will be discussing at the Children’s Climate Summit. Why are there no young people on the jury for the European Green Capital Award? Why are there no formal networks for young people to discuss climate change in Europe’s green capitals? Engaging the next generation is not even a criterion when deciding the next European Green Capital – and it should be. The next generation – our generation – is the one who will suffer the most. We are the ones who will have to clean up the mess you leave behind. And we are the ones who should be equipped to take over where you left off. It should not be hard to understand. And it will not be hard to do. In fact, we have done it for you. We are ready for jury duty right now. 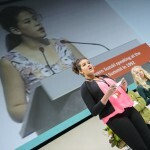 We have already established a network of young global climate ambassadors. We have just published a report about how to engage the next generation. We already did the strategic work and wrote the criterion for you – it is ready to be implemented. Tomorrow at the Children’s Climate Summit we will do an open session in this very building to present our ideas and discuss how best to involve the next generation as part of European Green Capitals. Come along if you can see that something is missing. Because what is missing – is right in front of you. We are children from Bristol and we cannot wait any longer. Our world is falling apart. You have the means to make it better and you have the means to make us part of the solution. That is what we will be talking about at the Children’s Climate Summit. Sustainable development is not just about men in suits and ties – it is about involving everybody from all backgrounds, all walks of life and all age groups. We will be the future leaders and we need to be able to change the world for the better. We might not have made the mess we are in – but it is time we turn it around because we are the ones who will be held responsible for the future of this planet. In 1992 Severn Suzuki spoke in Rio de Janeiro – a generation has passed and the next has taken over, but young people are still not an integral part of our common struggle. You must realize that it is not enough to live up to your obligations, you must enable us – the next generation – to live up to ours. Indeed, how can we call any development ‘sustainable’ if it does not engage the next generation? Climate change and sustainable development is your task, yes – but it will also be our task – and the task of the next generation and the next, and the next. Make ‘Engaging the next generation’ a criterion for the European Green Capital now. Don’t you see? That is what is missing – and it shouldn’t be.